Spring flowers and Spring colors! This is a triple layered bow. The base is a 2.25" shocking pink grosgrain ribbon, then a bright orange 1.5" grosgrain in the middle, topped with a 5/8" satin ribbon. 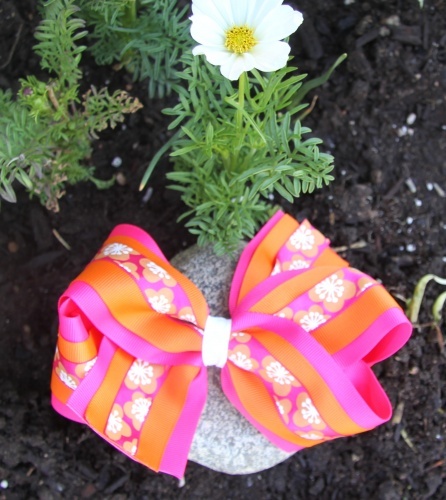 This satin ribbon is also shocking pink and has a orange gold flowers with a brilliant white star burst center. The middle is wrapped with a white grosgrain ribbon and it is attached to a French clip. Perfect Spring and Summer bow!